After reading a few articles on serum's i was looking for one to suit my age group. The serum is described to be suited for people in there 20's and 30's. So i picked up the packaging to read on and see what benefits this claims it can do. In your 20's and 30's, your skin is young but not always perfect. The advanced formula acts on 3 dimensions to help correct and improve the appearance of skin quality, as if perfected. LR 2412, a powerful active from 10 years of research, optimises the structure of the epidermis to improve the quality of skins appearance. 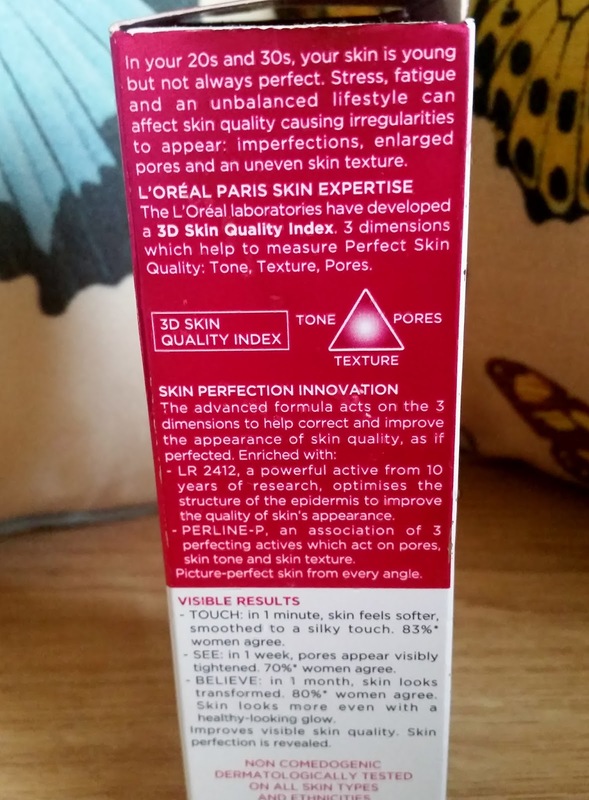 PERLINE-P, an association of 3 perfecting actives which act on pores, skin tone and skin texture. PICTURE-PERFECT SKIN FROM EVERY ANGLE. TOUCH: In 1 minute, skin feels softer, smoothed to a silky touch. SEE: In 1 week pores appear visibly tightened. BELIEVE: In 1 month, skin looks transformed. 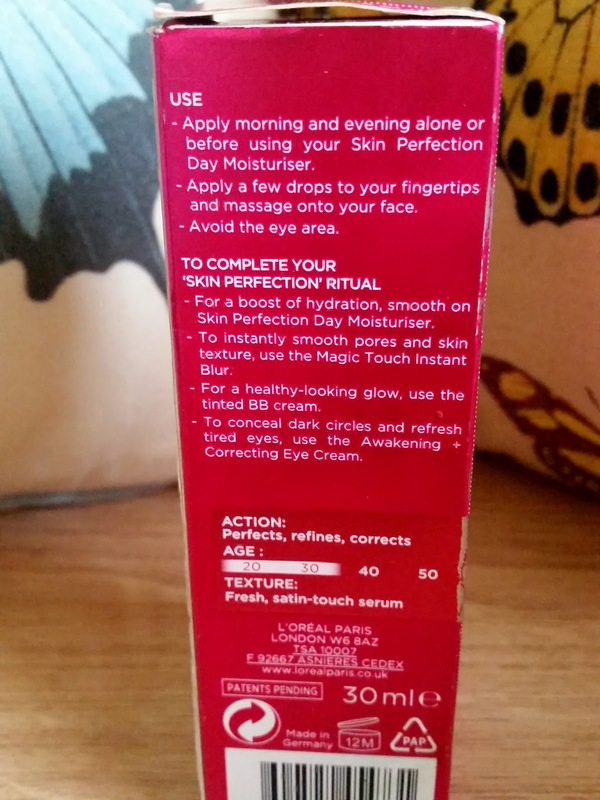 Apply morning and evening alone or before using your skin perfection moisturiser. Apply a few drops to your fingertips and massage onto your face. You can use this alone or with any moisturiser, as i have done and still get the benefits from this serum. Its packaged in a glass bottle and has a handy pump to dispense the product. The serum itself has a slight fragrance which is pleasant and is a white consistency. 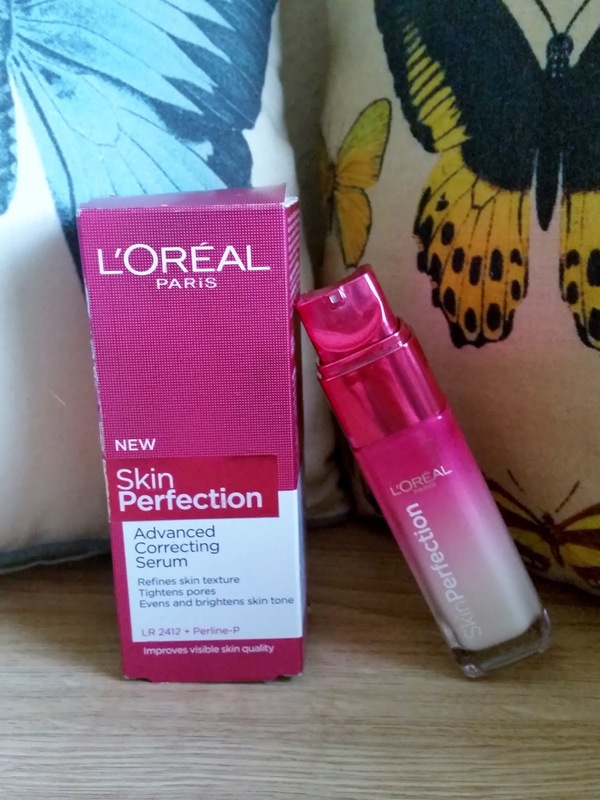 What i like about the L'Oreal Paris Skin Perfection Advanced Correcting Serum is that it isn't runny. You know when u go to apply a serum and its running everywhere except where u want to apply it. Also a bonus is that this is NON COMEDOGENIC which means its oil-free. It breaks down excess oil but doesn't strip your skin of its essential oils and moisture. I have seen a great improvement in my skin from tone to texture but what is also great about this is that my skin looks so much better in photos! This is like photoshop in a bottle! I like this serum so much I'm onto my third bottle. Price varies depending on where you buy it from, so i suggest having a search on GOOGLE to get the best price possible, X Neil.